Dennis Richardson was born on December 29, 1945, in New York City, New York. He enlisted in the U.S. Air Force on November 12, 1964, and after completing basic training, he was trained as a helicopter mechanic. His first assignment was as a UH-1 Iroquois helicopter mechanic and crew chief at Minot AFB, North Dakota, from 1965 to 1967, deploying to Southeast Asia for 6 months in 1966 with the 606th Air Commando Squadron at Nakhon Phanom Royal Thai AFB, Thailand. In 1967, Sgt Richard volunteered for a tour in Southeast Asia, and served as an HH-3E Jolly Green Giant flight engineer with the 37th Aerospace Rescue and Recovery Squadron at DaNang AB, South Vietnam, from 1967 to 1968. After returning to the U.S., he served at Ellsworth AFB, South Dakota, before leaving active duty on October 11, 1968. 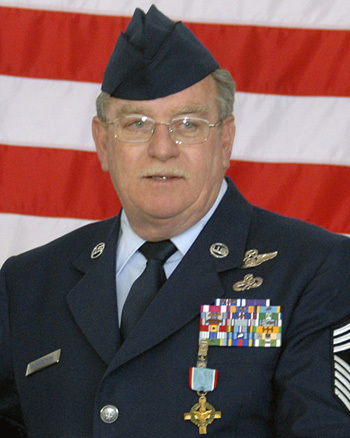 Sgt Richardson joined the New York Air National Guard in 1975, and served as an HH-3 and HH-60 Pave Hawk flight engineer with the 106th Rescue Wing until retiring as a Chief Master Sergeant on December 29, 2005. 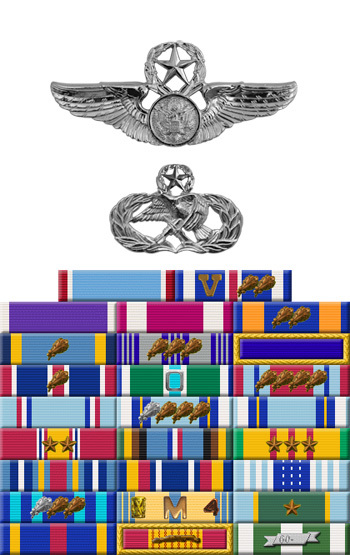 During his time in the New York ANG, CMSgt Richardson deployed in support of Operation Northern Watch in September 1997, from April to May 1999, and from June to September 2002. He also deployed to Kuwait in support of the War on Terrorism from October to November 2001. Dennis Richardson died on June 1, 2016, and was buried at Long Island National Cemetery in East Farmingdale, New York. The President of the United Sates of America, authorized by Title 10, Section 8742, United States Code, awards the Air Force Cross to Sergeant Dennis M. Richardson for extraordinary heroism in connection with military operations against an opposing armed force as Flight Engineer of an HH-3E Jolly Green rescue helicopter in Southeast Asia on 14 March 1968. On that date, Sergeant Richardson flew two sorties in an effort to rescue United States Air Force pilots who were surrounded by enemy troops along the Ho Chi Minh Trail. During the initial rescue attempt another helicopter had been driven off and Sergeant Richardson's helicopter had itself sustained significant battle damage. Despite their situation, and with complete disregard for their own safety, Sergeant Richardson and his crew elected to return and make a second rescue attempt. Coming to a hover 10 feet above the survivor's position, Sergeant Richardson stood fully exposed in the helicopter door and began lowering the jungle penetrator with one hand while gripping his M-60 machine gun with the other. Unknown to anyone, the enemy had occupied the area but held their fire, waiting to ambush the helicopter. Suddenly intense enemy fire erupted from all quadrants, resulting in additional damage to "Jolly Green 22" and wounding Sergeant Richardson. In an extraordinary display of courage and valor, Sergeant Richardson, despite his wounds, leaned far outside the door and neutralized charging enemy combatants who appeared intent on boarding the helicopter. Sergeant Richardson continued to lay down and effective blanket of defensive fire which enabled the pilot to maneuver safely out of the area. The selfless actions of Sergeant Richardson undoubtedly saved his helicopter and crew from certain disaster. Through his extraordinary heroism, superb airmanship, and aggressiveness in the face of a determined enemy, Sergeant Richardson reflected the highest credit upon himself and the United States Air Force.